Preheat oven to 180°C. Mix together breadcrumbs, parmesan and parsley in a bowl, then season to taste. Pour egg into shallow bowl. Dip chicken steaks in the egg, ensuring a full coating. Then cover in crumb mixture and place in a greased baking dish. Repeat process for each chicken steak. Combine butter and oil, and pour over chicken. Bake for 25 minutes. 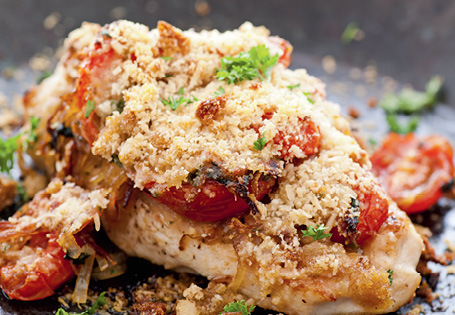 Scatter tomatoes around the chicken and bake for a further 5 minutes or until tomatoes start to wrinkle and soften, and the chicken is cooked through. 2 x Willowton Chicken Breasts – sliced in half lengthways.